EDITOR’S UPDATE: It was announced that Full Tilt Poker will be officially closed in the Spring of 2016. Player accounts will be merged to its parent poker site, PokerStars, and balances and VIP points will be transferred accordingly at that time. Having launched in 2004, Full Tilt Poker quickly became one of the most successful and largest online poker sites available. For more than several years, Full Tilt reigned supreme atop the iGaming landscape thanks to their cutting edge software and graphics, as well as their amazing selection of cash games, tournaments and sit and go’s. The fact the site was endorsed by many of the world’s top pros also made it one of the more trustworthy online poker websites out there. In 2011, things changed when the events of Black Friday happened, which left the site shut down for players in the USA by the FBI and Department of Justice. Players balances were suspended for a brief time while Full Tilt reached a settlement with the DOJ. After players funds were fully accounted for and subsequently paid out, it would be Full Tilt’s rival, PokerStars, who would eventually come in to bail out the fledgling brand. Later in 2012, the site was re-opened for players around the world (excluding the United States of course) and Full Tilt was on its way back to becoming one of the highest-trafficked poker sites anywhere. By 2014, Amaya Gaming had acquired both PokerStars and Full Tilt Poker, taking FTP in a new direction as they took ownership of the brand. Full Tilt Poker was known as a strong online poker site in the past and Amaya Gaming has been working hard to bring the brand back to its original glory. 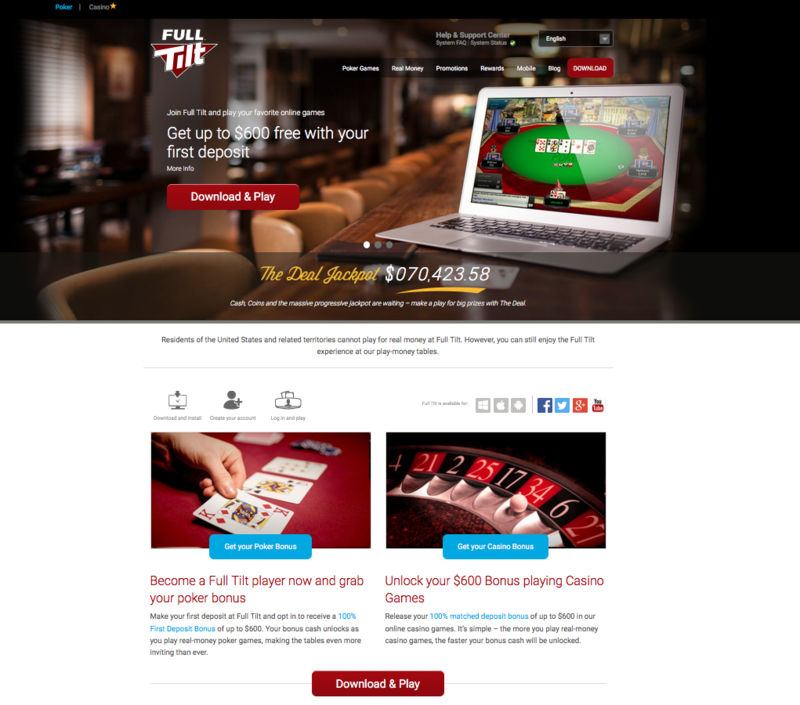 Full Tilt now offers a variety of poker gaming options as well as casino site. As operated by Amaya, the brand is regulated in the Isle of Man and licensed there as well. Top 3 in graphics and poker software. One of the easiest signup bonuses to clear ANYWHERE. Amazing VIP programs for both Rec's and Pro's. No USA players allowed, which cuts down on a huge sector of poker traffic on the site. Full Tilt Poker offers all new players an initial 100% match bonus worth up to $600. This is an easy bonus to clear and one that is similar to other first time bonus offers at most online poker rooms today. The site also has two reward programs, with this review going into detail on both, as well as the aforementioned new player bonus. When you open an account at Full Tilt, you’ll have the option to take advantage of their 100% First Deposit Bonus. With this bonus, you will see your first deposit matched 100% up to $600. To claim the bonus, you simply need to make a deposit at Full Tilt and opt in to the bonus option via mobile device or your computer. FTP will then match the deposit with the 100% bonus cash, with the bonus made available immediately after the deposit is made and you have opted in. To release the bonus cash, you will need to play real money games at FTP and earn Full Tilt Points in the process. While you play, you will have bonus cash added to your account as you earn the points. The bonus cash is released in segments of 10% of the initial deposit amount or segments of $20, whichever is smaller. You have 60 days from the deposit date to opt in to the promotion and then 60 days from the opt in date to earn the full amount of the bonus. In addition to the first deposit bonus, you will also have access to their numerous Welcome Freerolls. Once you have deposited for the first time, you will be able to take part in the free-to-play tournaments, with options running twice a day, for a thirty day time frame. $200 in Tournament Tickets or Ring Game Tickets is up for grabs each day. Full Tilt offers two rewards programs for members of the site. The Players Club is the standard option for recreational players while the Edge Program is for players who hit the tables on a regular basis. With the Players Club, rewards are earned for playing at the site. Prizes, access to exclusive tournaments, freerolls and more can be earned. One option for the Players Club is “The Deal.” The Deal is a game that costs just 1 coin to play and seven cards are dealt face down. You choose two cards to discard and the five card hand is shown. The hand you are dealt determines if you win a prize. You can win ‘The Deal’ jackpot by buying in for 10 coins. ‘The Edge’ program is designed for players who take poker a bit more seriously than your average recreational player. With this program, grinders can earn cash payments on a weekly basis, take part in monthly leaderboard challenges and gain access to the bonus-filled store. The Edge Leaderboards allow you to compete each month against other Edge members to earn a 30 day Cashback boost. Earn Full Tilt points while you play to receive cashback as part of the Edge program or convert points for cash and bonuses. The Edge Store is where you will find options for turning in points for cash bonuses. With this program, you earn a status level based on the rolling average of FTP’s earned. The first level is EDGE status which can be achieved with 80 FTP’s earned over 30 day rolling average or 70 in a 100 day rolling average. Edge Plus requires 250 FTP’s per 30 day rolling average or 150 per 100 day rolling average. The last level is Edge Prime which requires 500 for 30 day rolling average and 400 for 100 day rolling average. The gaming software at Full Tilt is constantly updated and is available on PC, Mac and most smartphones and tablets. You can begin game play in just minutes, no matter which platform you choose. To get started, you will need to choose the device you wish to use and then download Full Tilt’s software. Create a player account and then validate your account via email. For mobile users, the Full Tilt mobile application can be found at the App Store for Apple devices or fulltilt.com for Android devices. Once you enter the Full Tilt Lobby, you will find there are three views to be chosen, making it easy for you to choose the view you wish. Basic View offers a step-by-step guide to finding the games you want to enjoy. This is the best way to find SNGs or ring games with ease. The Standard View is a full-feature option where you have control over the gaming selection as well as game management. Use advanced filters, widgets and favorites to customize your personal gaming experience. The last option is the Mini View, which allows you to enjoy the same features as the Standard View but at a smaller size. This option is best when you wish to take up less space on the screen or have a monitor that has low resolution. There are several table features at FTP that allows you to customize your game play. Resizable table features allow you to set the view of the game. Stretch the table to cover the entire screen or make the screen smaller based on your personal preferences. Users can also enjoy five different custom layouts to place the tables on the screen as you like. To do so, simply click the Layout button which can be found at the top right of an open table. You can then click Manage Custom Layouts to get started. To customize your experience even further, choose the Options button to open the dialog box. From here you can choose the style of card deck, chat options and avatar display. You can also adjust the gameplay settings as well as general preferences from this section. Full Tilt Poker does allow specific poker HUD’s to be used during game play. The site has a list of third party software options that can be used as well as programs that are not allowed, all of which can be found here. Among the accepted programs including PokerTracker and Hold’em Manager 2. Because mobile game play has skyrocketed in popularity, FTP offers their poker software for iOS and Android devices. For the iOS device, players must have a device that runs on iOS 7.0 or higher. For Android, players must have a device that is 4.1 or above, with a minimum resolution of 800×450. The applications are free and easy to download, so you can quickly enjoy Full Tilt Poker via your mobile device. Full Tilt Poker offers a nice variety of poker games, with the most popular being Texas Hold’em. Players will find this game as well as Omaha Hi, Omaha Hi/Lo, Razz, Stud Hi, Stud Hi/Lo, 5-Card Stud, Draw Poker, Mixed Games and Other Games offered on the site with varying buy-ins and formats when it comes to real money game play. With cash games, blinds start as low as $0.01/$0.02, making game play affordable for every bank roll. Sit and Go’s can be found at Full Tilt, with the tournament beginning as soon as the required number of players is reached. 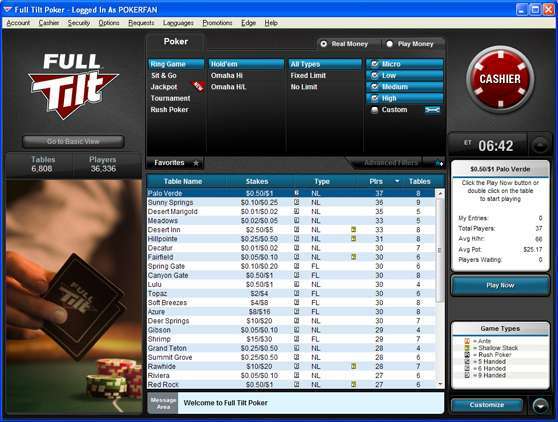 Full Tilt offers single table and multi-table SNG’s with a several variants for players to enjoy a plethora of option. As part of the SNG experience, members of FTP will find On Demand Tournaments which offer late registration as well as the Jackpot Sit & Go which provides a jackpot that can reach as high as 2,000 times the buy-in. Multi-Table Tournaments (MTT’s) can be found at Full Tilt with options offered in Texas Hold’em, Omaha, Stud, Omaha Hi/Lo and Stud Hi/Lo. 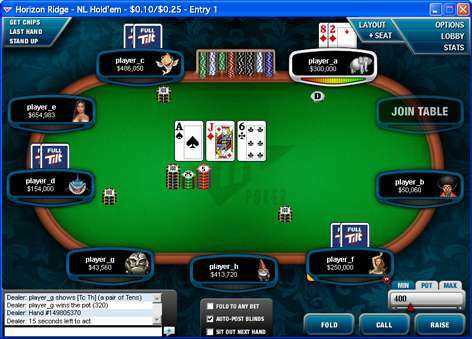 Options vary from pot limit to fixed limit and no limit based on the game type. You can view the full schedule of MTTs and SNGs by simply visiting the lobby of FTP. Based on information at PokerScout.com, Full Tilt Poker currently sits in the 10th position with the amount of real money poker traffic found at the site. The site has a seven-day average of 850 cash game players on the site at any one time, with peak traffic days hitting upward of 1,400 cash game players. Alongside the online poker offering, Full Tilt also provides casino game play. Enjoy slot games, blackjack, roulette and more when you visit the FTP Casino. Try the casino for free with the special $25 Casino Chip bonus with no deposit required. The casino offers a nice selection of casino games as well as promotions to earn extra cash or to simply enjoy online casino game play. New players to Full Tilt Poker will find several options are provided for depositing and withdrawing funds. FTP also offers a Single Click Deposit option to help you fund your account almost instantly. FTP also provides information on the amount of deposit, both minimum and maximum based on your location. Customer support can be reached at Full Tilt Poker via email at [email protected] The site also offers a comprehensive list of FAQs and Getting Started guide that can be of assistance.